Vanatics can be found across the globe. They are the most dedicated fans of Belfast’s poetic, enigmatic, musical genius. The 50th anniversary of the release of his most critically acclaimed album – Astral Weeks – has triggered a new wave of interest in how the city of Sir Van Morrison influenced his songwriting. Lynn Corken leads a walking tour around the streets of east Belfast where Sir Van grew up – she says he is “the soundtrack to my life”. She has met Van enthusiasts from Britain, America and Australia who’ve come to see their hero’s home city. The locations on Lynn’s tour include Hyndford Street where Sir Van was born on 31 August 1945. There she plays the song named after the street, where the singer recounts how “you could feel the silence at half past eleven on long summer nights”. People nod, smile, even close their eyes as they take in the lyrics and imagine a young Van Morrison at home and contemplating his future. Among the numerous nearby places mentioned in On Hyndford Street is “the Beechie River”. You can find it just around the corner at the Hollow, a childhood haunt of Van Morrison, which has been given a facelift in recent years. In one of Sir Van’s biggest hits – Brown-Eyed Girl – he is “down in the Hollow, playing the new game”. The Hollow is where two rivers join to form the River Connswater. It’s now part of the Connswater community greenway and is right beside Elmgrove Primary School, where Sir Van was a pupil. With her tour group in the Hollow, Lynn explains that the jaunty pop song Brown Eyed Girl came in 1967 and the album that followed a year later was a huge contrast. Astral Weeks fuses jazz, blues and folk and initially was not a major commercial success. But as time has gone on, critics have come to regard it as Sir Van’s masterpiece. BBC Radio Ulster presenter Ralph McLean believes it is “the best record ever made”. He is one of few people to have interviewed Sir Van a number of times. “Astral Weeks is an incredible record – a singular poetic vision,” he says. Ralph notes that it reflects “a strong sense of Belfast” and he points out that Sir Van once said “there are two stories in music – leaving and going home”. “Astral Weeks is about yearning,” he says. He believes that it is the musician’s jazz roots that help to explain why he is still turning out album after album, more than 50 years after his breakthrough. “I think first and foremost, Van is a jazzer,” explains Ralph. “He’s in the moment – he wants to be moving onto the next thing. Thousands of people still see him play live every year. But two of his most special live performances were surely the concerts in 2015 to mark his 70th birthday in Cyprus Avenue in east Belfast – a street made famous by having a song named after it on Astral Weeks. It is this wide, tree-lined avenue where Lynn’s tour finishes. 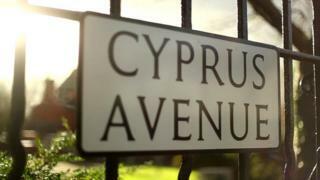 Remarkably, 12 years before Astral Weeks was written, it was on Cyprus Avenue that her father proposed to her mother. It’s perhaps no wonder that the whole family are huge Van fans. “I just love the symmetry of it, the circle of life,” she muses. The Vanatics who’ve listened to her give them the life and times of their hero describe him in similar ways – a “genius”, a “poet”, an “artistic ambassador” for Belfast – and the east of the city in particular. They hope that Belfast will make the most of this legendary legacy as the musical magic of Sir Van Morrison will enchant millions for many decades to come.